MainAll NewsUS & CanadaUS to Revoke Aid to PA Over Threats to Dismantle? 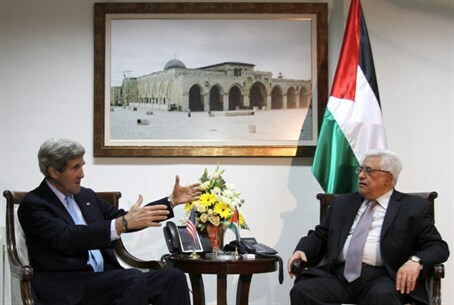 US to Revoke Aid to PA Over Threats to Dismantle? State Department official hints that financial aid, political support for the Palestinian Arabs to be 'seriously harmed' if PA disbanded. Palestinian Authority (PA) Chairman Mahmoud Abbas threatened to dismantle the PA on Sunday, in a move which would dissolve the Oslo Accords and allegedly make Israel "vulnerable" to international legislation, according to some analysts. But the move could have serious consequences for Palestinian Arabs, not Israel, in the event the PA chooses to disband. "Of course [the PA disbanding] will have serious consequences," US State Department Jen Psaki stated Monday to Yediot Aharonot. "Obviously this is not in the interest of the Palestinian people , and all that has been achieved will be lost." Psaki stated that the US would withdraw financial support for the PA, and for the Palestinian Arab people as a political body, in the event Abbas follows through on his threats. "The US has made tremendous efforts to build Palestinian institutions in the PA, and so has the international community," she explained. "The move will seriously harm the US-PA relationship, including in terms of financial aid." The move may be another serious blow to US-PA relations, after Washington threatened to cut financial aid to the PA for torpedoing peace talks. The PA receives about $400 million annually in US aid.